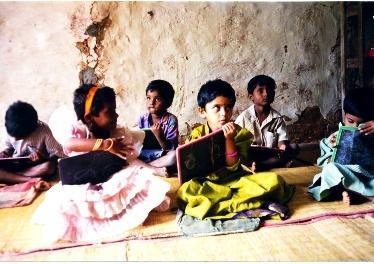 iCARE supported the Neelbagh School (located near Mandanpally, about 100 kms from Bangalore) from 2004 until 2016.
percentage of female students at the school. More recently, iCARE’s support focused on strengthening the knowledge and skills of teachers including the new state curricula for Languages, Science and Mathematics. Student enrolments increased from 174 in school year 2003-04 to 376 in 2013-14. The percentage of female students increased from 42% in 2003-04 to 49% in 2013-14. Each year between 2009 and 2015, the school achieved 100% pass rates in the Class 10 Secondary School Leaving Certificate exam compared with the average pass rate for the state of 82%. Read here how educating his daughters transformed a Father's attitude too! When one child is educated, parents make sure the other children also get the advantage of a good education. People from the surrounding areas see the impact education has on a child’s future and encourage their own children to study.